The record is made up of 1 map. It was created in 1852. It was written in German. The original is part of the British Library: Map Collections. Title continues: ‘Zu C. Ritter’s Erdkunde, Buch III, West-Asien, Theil XII. Bearbeitet von H. Kiepert, herausgegeben von C. Ritter. Berlin, 1852 Verlag von Dietrich Reimer’. 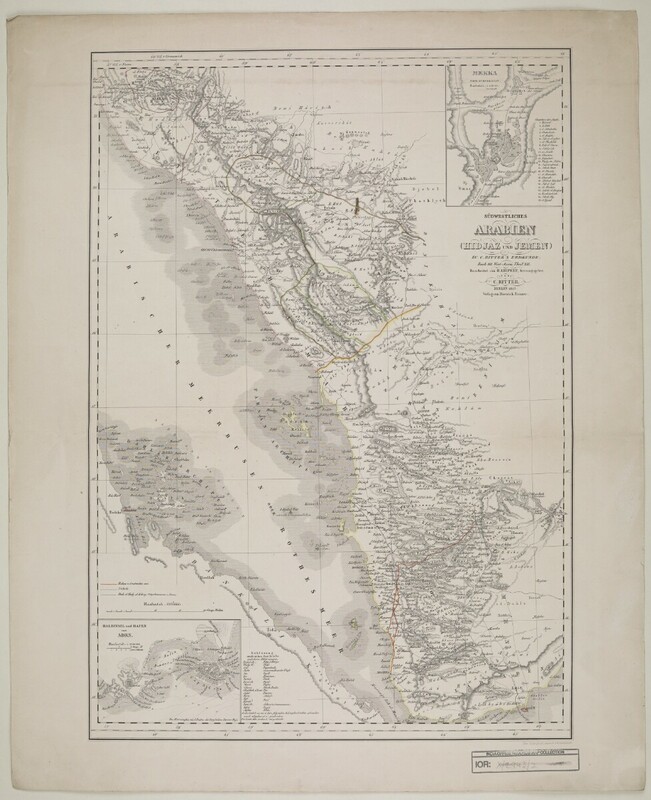 Map of Hedjaz [Hejaz] province showing various routes including the Hajj pilgrimage, Carsten Niebuhr exploration journey, and J.G. Hulton and Charles J. Cruttenden expedition of 1836. In the bottom right-hand corner there is a table of reference listing Arabic geographic terms with German equivalents and abbreviations. • plan of Mecca entitled ‘Mekka nach Burckhardt’ drawn to scale 1:30,000 with districts numbered and listed in a table of reference; • map of peninsula and the port of Aden entitled ‘Halbinsel und Hafen von Aden’ drawn to scale 1:200,000 with depths shown by contours.